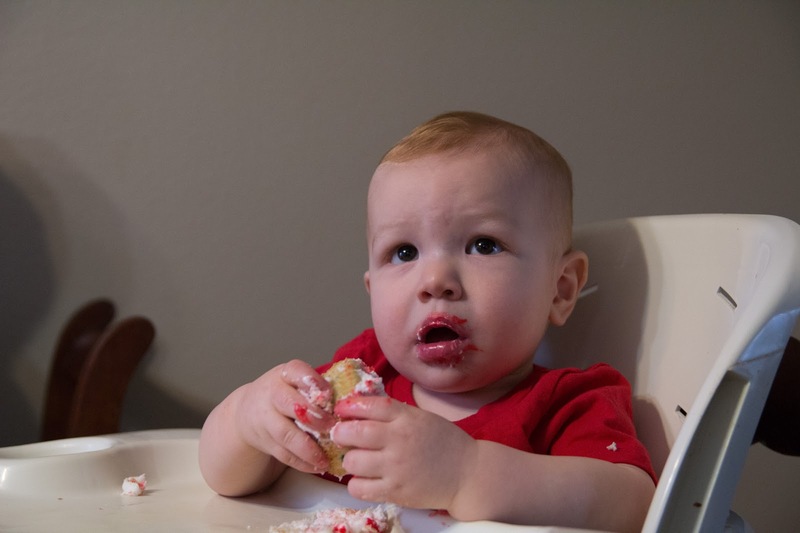 We celebrated Calvin's first birthday last Saturday with family and friends. For each of our boys, I've done something with their first name for the theme of their first birthday. 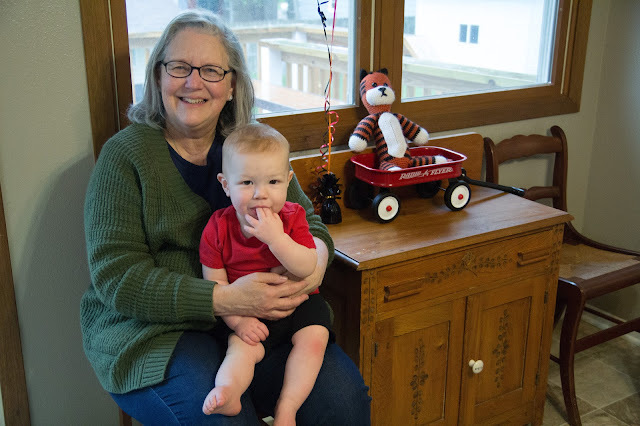 Henry's was Oh Henry and Wesley's was W is for Wesley, so it seemed natural to tie in Calvin's first birthday with Calvin and Hobbes! I truly tried to keep it super simple! I pretty much took one Calvin and Hobbes comic book and cut it up to make this party happen. 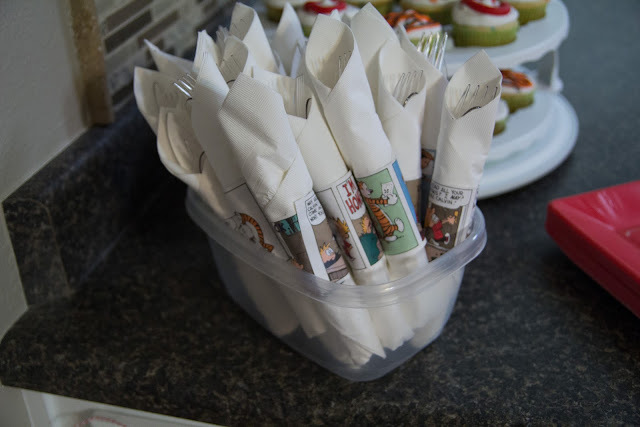 I wrapped all of the plastic silverware in napkins, then I taped a small comic strip around each to keep them closed. I truly had other ideas for the cupcakes, but time and supplies were not on my side. I still love how they turned out. I did Cs for Calvin and messy tiger stripes for Hobbes. I used cake mix to make the cupcakes, but I subbed out milk for the water and melted butter for the oil. They taste way better that way in my opinion. 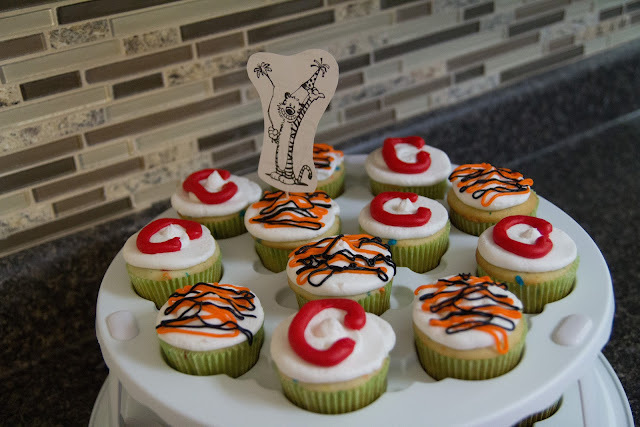 I frosted them with my favorite Wilton buttercream icing, then I added the Cs and tiger stripes with store bought tubes of decorator icing. Red and black are very difficult shades to color icing at home. 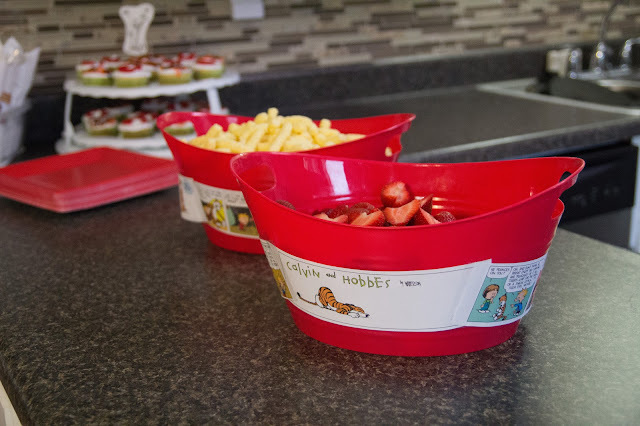 I have used these red bucket from the dollar store for quite a few parties. I cut out strips of comic to put around them as well. I made a simple bunting of comic pages, too and strung it along our peninsula and in front of one of the kitchen windows. I cut triangles of the same size using a cardboard pattern, then I just taped them on some string. One of Calvin's gifts was a small wagon which fit perfectly with the theme because there are many strips of Calvin and Hobbes riding in Calvin's wagon. One of my friends made the Hobbes. It's been in the comparison photo I take of Calvin each month. I dressed Calvin in a red shirt and black shorts somewhat like Calvin in the comic wears. There's my mom! Hi mom! 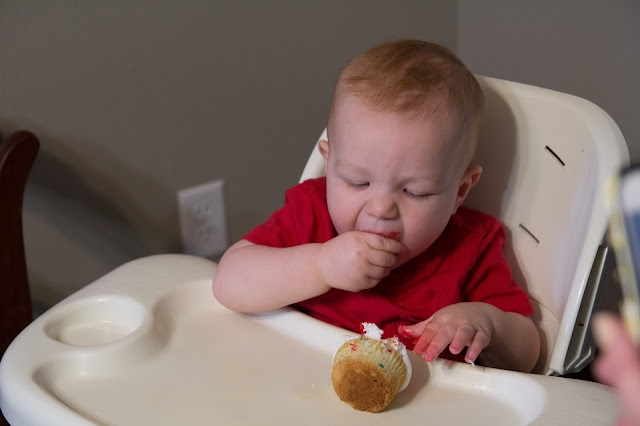 Calvin dug in to his cupcake right after we gave it to him. This is about half way through, but he pretty much destroyed it! Now, for the easy snack! I'm not one to usually arrange activities to do at parties, but rain was in the forecast, so the day before, I scoured Pinterest for ideas. I came across this idea, but I decided to adapt it so that the kids could make it. 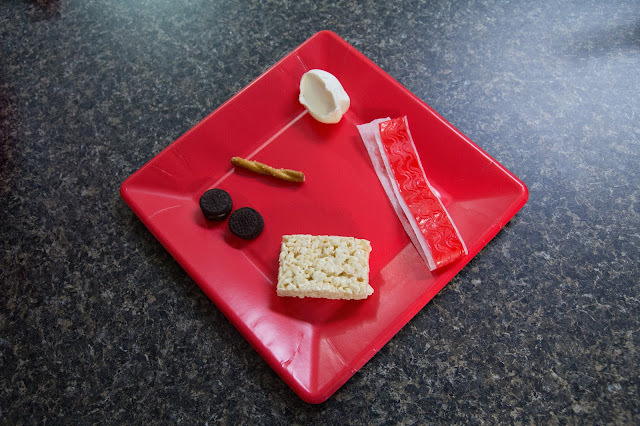 I got Rice Krispie Treats, Mini Oreos, Fruit by the Foot, twisted pretzels, and some frosting. I divided each Fruit by the Foot in half. The kids wrapped the Fruit by the Foot around the treat, then attached the Oreos with the frosting to make wheels. The twisted pretzel was great for applying frosting and for a handle for the wagon. I did the twists instead of just sticks thinking they'd be a little more sturdy. 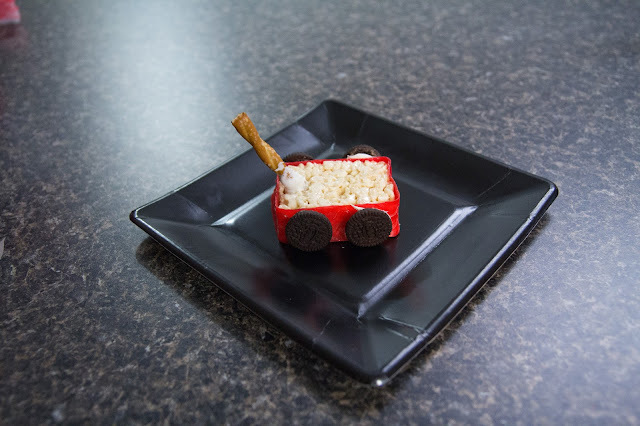 The result is a little red wagon! So fun, right?! All in all it was a great party without going too crazy. What do you think? Linking up with Shine Blog Hop, Party at My Place, Intentional at Home, Idea Box, and Creative Corner.